American Racing Headers C4-84134300LSWC - American Racing Headers ARH LongTube 1-3/4 304-SS Headers with cats and 3inch x-pipe Corvette C4; 1984-1991. C4 Corvette 1984-1996 1 3/4 Primaries With 3 Collectors, 3 X-pipe (With Cats). 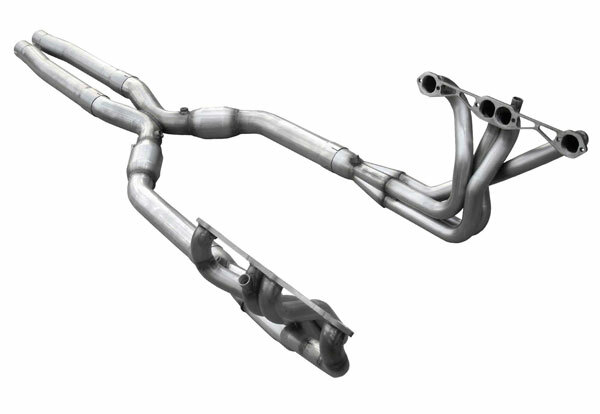 C4 Corvette owners, American Racing Headers has finally answered the call. Your long awaited C4 systems are finally here and not a moment too soon! With features you’d expect from ARH including all 100% US made 304 S/S construction, 3/8” thick flanges with hand ported inlets, merge collectors with scavenger spikes, your choice of 1-3/4” or stepped 1-3/4” X 1-7/8”primaries and our 3” X-Pipe equipped exhaust (with or without our 200 cell metallic substrate cats), it simply doesn’t get better. The system is designed to splice into your factory or aftermarket exhaust on 92-96 models but will also fit 84-91 Vettes with mild adapting. Will also work with straight or angle plug heads. Expect minimum gains of 25-30 RWHP combined with a quality tune.